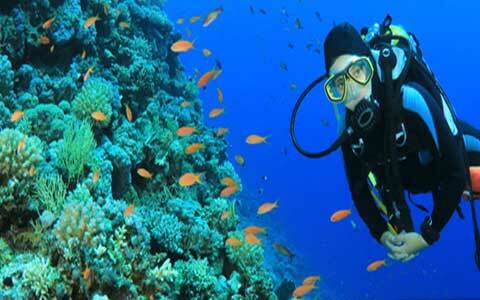 Get into the adventure of Scuba Diving In Andamans! The Andaman and Nicobar Island surely is the land of paradise where you get to experience some of the finest adventures here, which include water sports. These are a group of more than 572 Islands that have abundant of rocks and islets. These Islands are situated in the Bay of Bengal in the south east to the Indian mainland. These Islands stretch over 700 kms from the north to the south. Some of the large Islands present here are the middle Andaman, south Andaman, baratang and the little Andaman Islands. The richness in the aquatic life of Andaman is what makes it a popular place for tourists. Many tourists are dying to see what it feels like to be underwater. We have a lot of experience being on land but venturing into the depths of the water is something unique and different. The coastal water that surrounds these Islands is what makes it the abode of coral reef. Moreover, the formations underwater is totally undamaged by human activity. If you are considering Scuba Diving in the Andaman and Nicobar Islands, then the best time is usually from December to April. All you need to do is to get some Scuba Diving equipments from a dive shop that sells a good quality of diving equipments to make sure that your safety is ensured. You can also get a standard renting gear at the best costs and experience the adventure underneath. These equipments include balanced regulators, open heel fins, masks, shoes, web suits, sea quest BCDs, etc which will protect you from any danger and ensure safety as you dive. You can also get an underwater digital camera for rent if you wish to keep some of those unforgettable memories. You can find typically great cylinders so that they do not get contaminated when you go underwater. When you are done with the purchasing, you can now get to see the amazing aquatic life under the water as you swim gracefully like a mermaid. You can find a lot of tropical fish and corals to fill your adventure underwater. What is more? You will also have a coach to help you with your scuba diving and ensure your safety. Scuba diving is extremely fun and safe. If you are an expert you have the freedom to venture all by yourself, if you are a beginner, you will be taught how to do so. Andaman is known for the finest dive spots where you can enjoy your experience and reap the best out of your scuba diving experience. You can find huge schools of fish surrounded with lush coral reefs. All these make the Islands a must dive destination. Enjoy this fantastic adventure as you venture into the fine waters of aquatic life to make an unforgettable experience as you enjoy the beauty of these Islands finest waters. In the end of the day, it is an adventure that really has its rewards as you shall find the hidden treasures of this magical place.